I have always loved grains. I was lucky enough to grow up with a mom who enjoyed playing in the kitchen, and I also became a vegetarian in my teens (a 25-year stint that is now over), so I was exposed to and ate many different grains from an early age. Later, as I did my Health Coaching training, I also learned about various diets like GAPS and SCD and Paleo, all of which address how grain proteins can be problematic for people to digest. And then my husband, who was reaping the (mostly!) benefits of the various diets I was experimenting with during my training, finally decided it was time to try going off wheat to see if it helped his digestion. For my part, I love cooking and playing with all kinds of real, whole-food ingredients, so I happily dove into wheat-free, gluten-free, grain-free experimentation in the kitchen. 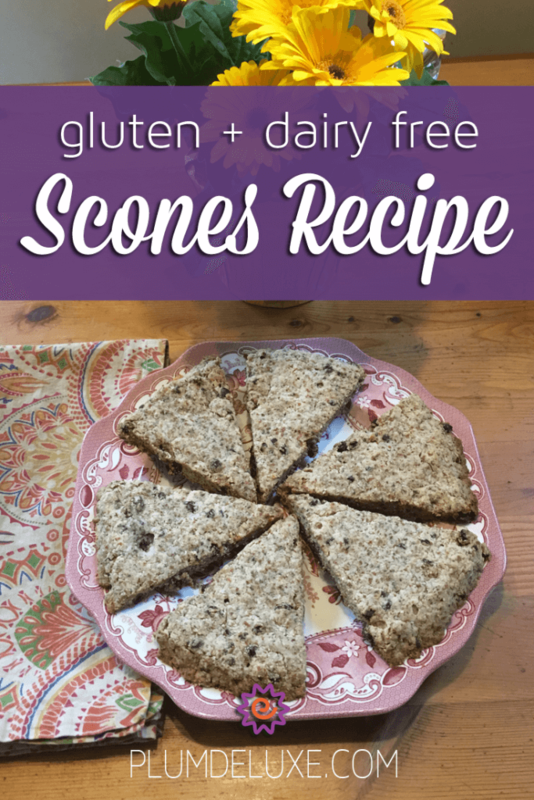 These gluten free dairy free scones are one of my happy kitchen experiments. They are not fluffy, cakey scones, but have a lovely, dense, chewy mouth-feel. They are made with almond flour which has the skins removed, making the almonds are more digestible. (The skins contain phytic acid, an anti-nutrient that makes the nutrients from nuts, seeds, grains, and legumes less available.) There is no added sugar, only that naturally occurring in the almonds and currants (or other dried fruit). The coconut oil provides a luscious texture without the use of butter for those who are dairy-free as well. And the chia seeds, along with the almond flour, provide a nice protein hit. I hope you love them as much as we do! There are two options for the amount of water you include, depending on whether you prefer your scones a little more moist or dry. 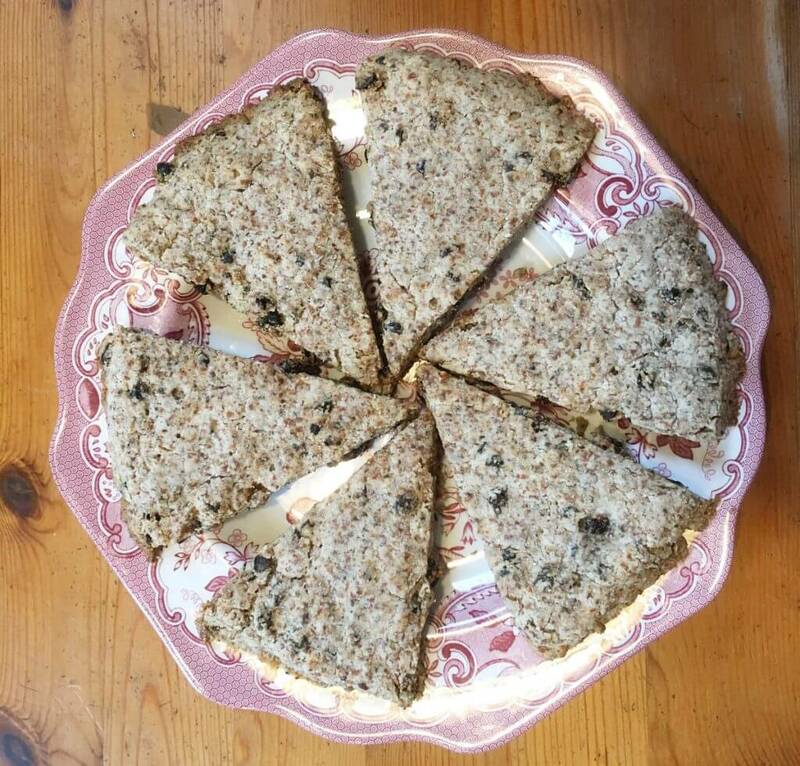 I served these gluten free dairy free scones at my last Healthy High Tea in November, with cashew cream and no-added-sugar chia-strawberry jam, and they were a big hit. Mix chia seeds and water and set aside to gel for 10 minutes. If you prefer your scones dense and moist, use 6 tablespoons; if drier, use 5 tablespoons. In a mixing bowl, combine almond flour, baking soda, and salt. In a small (food processor) bowl, mix together the coconut oil, lemon zest if using, and the gelled chia seed mixture. Once it is well combined, stir or pulse the dried fruit in gently. Pour the wet ingredients into the dry and fold to combine. Scoop out the dough onto the parchment paper and shape it into a 1/2 inch thick circle with your hands. Using a knife, cut the circle into 8 scones; using a pie-spatula or small pancake turner, gently separate the pieces from each other. Bake 17-20 minutes until browned, then remove to a cooling rack. Katy is a Holistic Life Coach with soul who helps curious and soulful women practice presence so they can feel more at home in their bodies and at ease & resilient in their lives. Connect with her at www.katytaylor.com.